I was on Skype a few weeks ago with my son Tyler. Between talking about his schoolwork and his roommate, he mentioned to me how one of his former classmates at ISM is complaining about her mother. His friend is a first year student attending a large Canadian university where she lives in an apartment with her brother. Her (Their) father is also with them while the mom is in the Philippines taking care of an elderly parent. The mom calls (or Skypes) every day, constantly checking up on her two children. Now she's taken to telling her daughter that she needs to get home from the university by 5:30 pm every day. The kid is going absolutely bananas. Tyler and I laughed a bit and after we disconnected, I thought about it for a bit. The obvious thing here is that the mother here has not learned to truly let go of her children. This is not surprising given the culture here in the Philippines where children normally don't leave the house until they are married...and sometimes not even then! I guess she hasn't learned the fine art of letting go. Whether or not we choose to let go, we must understand that the college experience in the US/Canada is vastly different than the college experience in the Philippines. If you've been following the blog, you probably know how different the admissions process is in the States from here in the Philippines. But the real differences lie in the every day experiences of the typical college student. In the US/Canada, most colleges are residential. In the Philippines, it's very commuter oriented. In the US/Canada, most students live in residence halls (dorms). In a lot of schools, freshmen are actually REQUIRED to live on campus even if their home is a five minute drive away. Because of this, the social scene on campus centers around the residence hall. On others, it centers around the fraternities and sororities. This brings me to my first point: unless cost is a huge issue, all students (especially international students) should live on campus. It's tempting to have them live with a relative nearby but I think that's a really bad idea. They'll have a more difficult time integrating with the life on campus, they won't make as many friends and I think their college experience will be greatly diminished. Some students opt to leave the dorm after a year or two and live with three or four friends in a shared apartment or they rent a house together. This kind of living fosters independence...there's nothing quite like having to cook and clean up after yourself. Students will appreciate having their maids at home after they've cleaned their own bathrooms once or twice. It's not easy letting go, I will be the first to admit that. It's not something that's learned overnight either. For me, the process took years and years. In my biased, unlearned opinion, the best thing we can bequeath to our children is good judgment. I think the best way for children to learn good judgment is to practice it every day. You let them be responsible for their own actions and let them be punished by the natural consequences of their bad calls. As parents, we naturally want to shield them from the world but I say, that's the worst thing we can do for them. Let them fall, let them trip, and let them skin their proverbial (and literal) knees. In doing so, we learn to distance ourselves from our children's lives. We love them, yes...but we are not them. Important distinction there. After all that, it's still not easy. I remember when I finally had to leave Tyler behind at his University, the final goodbye as it were. He walked me all the way back to South Campus Hall where I was parked. When the time came for parting, no hugs, no tears...just a high five (we're both men after all) then just like that, he was gone. I turned to see if I could see him walk away but the pillars blocked my view. I finally caught a glimpse of him, hands in his pockets, bouncing every so slightly with each step. He didn't look back. Not even a little bit. I still struggle with it. When we Skype and he's almost an hour late, it takes a lot not to berate him for his tardiness. Usually, I'll get a "Sorry, Dad, I was working and lost track of time." Or if I notice he is on Facebook at 2:30 in the morning. I once chided him to go to bed when he replied, "Are you seriously remote controlling my bedtime from 10,000 miles away?" Indeed! Over the Christmas holidays, I received a most welcome gift. Well, it wasn't exactly a gift because I had worked for it for over a year. 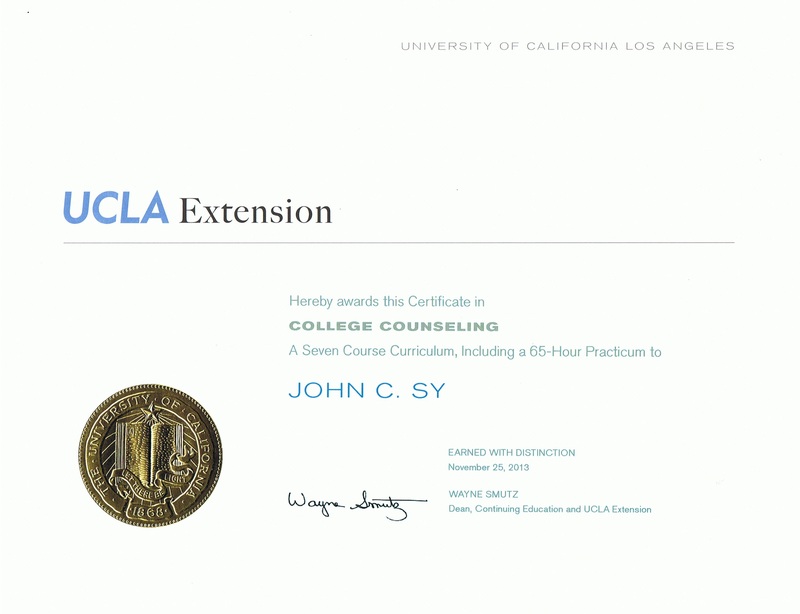 The non-gift in question was my diploma from UCLA Extension declaring that I finished their six course + 65 hour practicum college counseling program and was now a certified college counselor. Yay for me, I guess. I got into this program because I wanted to set up a US college admission consultancy here in Manila. I looked around and realized there was almost no trained, qualified guidance for local students who want to attend US universities. For most of them, they simply shotgun their applications all over the Ivies and maybe a couple of other schools they may have heard of and hope for the best. Sometimes they don't get in anywhere and they walk away disappointed. Usually, they're turned down at the Ivies and have to "settle" for what a good friend of mine calls "second tier universities". These guys miss out on learning about great colleges they might not have heard of and where they would have thrived had they gone to college there. So, at the risk of sounding self serving, these are the reasons why you, the prospective applicant to US colleges, need a certified and qualified college admission counselor. 1. A college counselor will help you apply to schools which are a fit for you. In Manila, we are looking at five or six universities. There's the Big Three: UP, Ateneo and La Salle. Then we have UST, College of St. Benilde, UA&P, and maybe UE for pre dentistry types. But in the U.S. alone, there are over 3000 four year degree granting institutions. Even if we were to narrow it down to about 500 schools worth considering, that's still a lot of schools. That's a lot of research. A good counselor will help narrow down the choices depending on the student's preferences, personality and academic talent. Without that counselor, most kids again just shotgun their applications all over the Ivies. 2. A college counselor will keep you on task. There's nothing quite like procrastination especially for the busy high school senior. A college counselor will be the voice of your conscience telling you when things have to be done. No sending of applications the night before it is due. Essays will be written, cleaned up and edited. Standardized tests will be taken on a fixed schedule so that ideally they are done in plenty of time for applications. A really good counselor will insist on working with you beginning your junior year. 3. A college counselor is a great source of information about US colleges, applications, and college life. What are the important things to look at when considering colleges? How seriously should you take rankings? What is dorm life like? How do I deal with homesickness? If you don't have a college counselor, you'll just have to guess. 4. A college counselor makes a great stress valve. Hopefully, a good college counselor will keep the stress to a minimum but there is some stress involved. At times, you need to vent or talk to someone who is knowledgeable about what's going on. Or you need to ask whether applying to this or that college is a good idea. 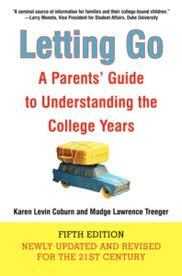 A college counselor talks to parents too and is a resource for nervous or anxious parents and if necessary, acts as a mediator. 5. A college counselor is a good and knowledgeable application essay editor. Sure you could go to your English teacher or ask your older sister to help you out but will they know what the colleges are focusing on when they read your essays? A good college counselor will. Your college counselor will help your brainstorm essay ideas and help you through the many drafts until you get one that truly shines, makes you stand out, and helps the admissions office realize what a wonderful candidate you are. There are other reasons but these are the five I can think of right off the top of my head. Regardless of whether or not you choose to hire a college admissions counselor, I wish you the best of luck in your applications! If you come, you won't get an Ivy League education. You'll get something better: a sense of your own power to learn and discover and achieve. And unlike the Ivies, where reports of grade inflation is as common as a 3.9 GPA, New College isn't about the gold star. It's about the process. Students who like the pure thrill of learning--of wrestling with tough topics and coming out the other side--will love it. 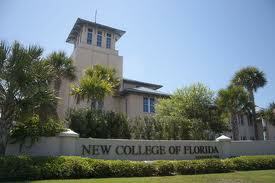 The New College of Florida (www.ncf.edu) refers to itself as the Honors College of Florida. It is another one of those small, very intellectual, liberal arts college I seem to be very fond of. Ensconced in the warm sunny city of Sarasota, Florida, it is home to just over 800 bright and curious undergraduates. The college was founded in 1960 and unlike Reed and St. John's (which I wrote about in earlier posts), New College is a public liberal arts college, affiliated as it is with the Florida state university system. The differences don't end there. Unlike Reed and St. John's which have strict curricular requirements, New College is more free form. Instead of signing up for a specific number of credit hours, students negotiate contracts with their faculty advisers on what they would like to learn this semester. To graduate, a student must fulfill seven such contracts. These contracts outlines a student's courses, extracurricular activities and what the student has to do to fulfill the contract. There is even room to fail. A contract for example, might ask the student to take five courses but earn satisfactory evaluations at only four of them (five, of course, would be better). But...what will that do to a student's almighty GPA, the academic fuel of many an Ivy League student? Nothing. Because at New College, there is no such thing as a GPA. There isn't even a grade. All students receive written evaluations of their work. The faculty and student body here bristle at the idea that getting an A means mastery of a certain body of knowledge. They would much prefer to see exactly what they did right and what they did wrong. But don't you need grades to get a job or get into graduate or professional school? Apparently not. In 2010, 86% of New graduates who applied to PhD programs were accepted and a full 100% of law school applicants got in. New is also among the top producers of Fulbright scholars per capita easily beating out the likes of Harvard, Yale and Stanford. The overriding principle of education at New is that all students should be responsible for their own learning. It's up to them to decide what they want to learn and up to them to decide how they are going to get there (with help from their faculty advisers, of course). The emphasis here is always on the learning and not the grades (which don't even exist). There is no cutthroat culture as there is in so many other colleges simply because there is nothing to compete over. Along with the seven contracts, students are required to complete three Independent Study Projects (ISP) each during a four week January term between the first two semesters, i.e. you have the first semester, Christmas break, then return to class in January. You do a four week term that results in an ISP then on to the second semester. What is the ISP for? It's to allow student driven research. In a sense, it's all a rehearsal for...you guessed it, a senior thesis! Each student at New College is required to write...and orally defend...a substantial academic thesis. The public is invited to attend and the graduating senior is responsible for emailing all the students an invitation to the big event. If this type of learning is exciting to you, the best is yet to come. The college accepts just about half its applicants, none of the hyperselective nonsense of the Ivy League. They do say though that if you're the kind of student that needs to be spoon fed then you should go elsewhere. The freshman retention rate is only 86% which means 14% of incoming freshmen leave to go elsewhere. So it's not too hard to get in (assuming you are fairly bright to begin with) but staying in will be the struggle. So if you're looking for an education and not just a fancy, overrated Ivy degree, and you have a free spirit and the willingness to challenge yourself, New College may be just right for you. And you can spare yourself the bitterly cold Northeast winters.